When the creators of Barbie decided to make a set of Elizabeth Taylor Barbie Dolls they did not hold back and created a stunning range of figures with fantastic looks, clothes and accessories – the newest dolls are no different. Violet Eyes and White Diamonds, are stunning. Not much of a Barbie fan myself, I have to say that these 2 new Elizabeth Taylor Barbie are gorgeous. Mind you, they are not the kind of Barbie you play with! These are collector’s doll. Both of these beautifully crafted, limited edition dolls feature Liz Taylor in stunning gowns, with many accessories (including mini perfume bottles). 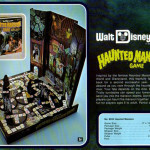 Mattel’s famous Barbie dolls are renowned across the world because they are more than just a treasured toy from our childhoods; they have become must-have collectibles for countless enthusiasts and, in a way, celebrities in their own right. Because of this, it is only fitting that celebrities be immortalized in their image as additions to the more traditional Barbies. Why an Elizabeth Taylor Barbie? There is no better model to style a Barbie on then this well-loved actress. Elizabeth Taylor is one of the most famous and most respected women, both in the movie industry and in the world, and her memory has continued even after her death. There is no better way to preserve her memory, highlight her success as a woman and an icon or replicate her stunning, unmistakable image than through a high quality Barbie doll. She was one of the first actresses to gain notoriety and a fee of a million dollars so it is fitting that she is one of the first to be honored with such a set of figures. These alternative Barbies make a brilliant collection because they are well designed dolls that have been made with a dedication to creating Elizabeth Taylor personality and image in the smallest details – the face molds were even authorized for use by Elizabeth Taylor herself and the White Diamonds model even comes with a signed certificate of authenticity. What better gift is there for any fan? This doll is recognizable by her short brunette locks and glamorous white gown and comes with additional features that add to her personality, including her high-class jewelry and the miniature perfume bottle that symbolize the fragrance the doll was named after. Authenticity is what makes this doll so appealing to collectors – both of Barbie products and Elizabeth Taylor merchandise. The dress has been inspired by those worn by the actress herself and the mold of her face has been carefully considered to replicate her striking looks perfectly – and was even approved by Elizabeth Taylor herself. In short, this is far more than just another Barbie or a slightly altered doll; this is a glamorous, unique model that any fan would love to own. In contrast to the white elegance of White Diamonds, this doll offers a sultry, sophisticated doll dressed all in black. This model – designed by Robert Best – exudes class like the actress herself and is the ideal way to celebrate her glamour. The sense of style and attention to detail with this figurine is extraordinary. The satin dress is accentuated by the opera gloves and black pumps and there is also additional jewelry in the form a rhinestone brooch, a bracelet and every stars friend – the sunglasses. There are two features that are shared between the Violet Eyes and White Diamonds dolls that will also be highly appreciated by collectors and fans alike: the inclusion of the miniature perfume bottle and the red ribbon on her dress. While the jewelry items are just basic accessories, these features go further to capture the spirit and personality of Elizabeth Taylor. 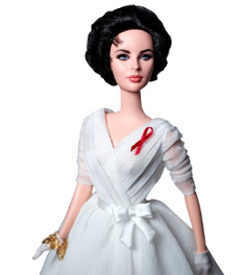 The perfume bottles represent the fragrances that the dolls are named after while the ribbon is a replica of the one worn for AIDS/HIV to highlight her charitable nature and dedication to the cause.